Than-Phong The Planet Martial-Arts is dedicated to teaching traditional martial-arts techniques and philiosophy. Our programs are for students ages 5-years-old and up, male or female. We teach lessions to small groups and give FREE uniforms for beginners who sign-up for 3 months or more. 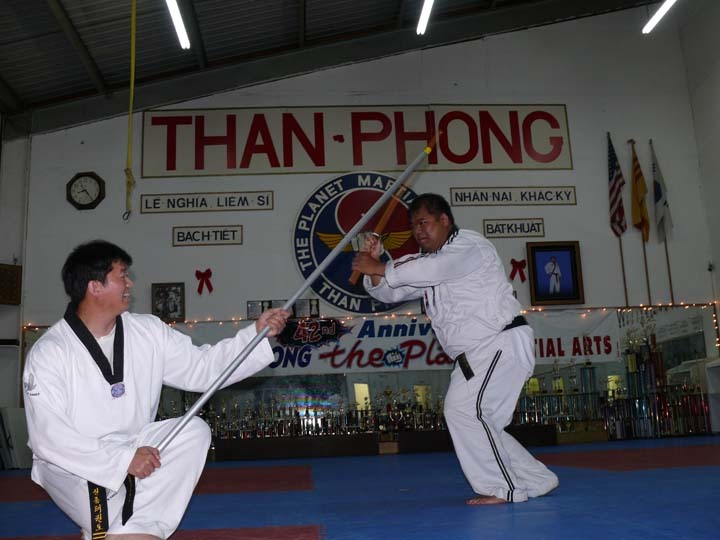 The training curriculum for Than Phong consist of Basic Training, Forms, One-Step Sparring, Free Sparring, Breaking, Philosophy, Self-Defense, and Weaponry. Depending on what rank the students are, the curriculums will vary in emphasis on one or more of these categories. In addition to training within the school, the students are also given an opportunity to compete in tournaments across the bay area. The followings are the description for each category of the Than Phong Curriculum. Students learn and practices many different types of Blocking, Punching, and Kicking techniques. Through constant repetition and practice, the techniques become second nature, and require less reaction time. Form is a combination of all the Basic Techniques applied in different directions. It is a number of set movements configured into a basic pattern. When the forms are done correctly it will build up strength and stamina, as well as re-enforce the Basic Training. One-Step Sparring is a two person exercise. It is a combination of techniques aim towards a target. One-Step Sparring teaches a student accuracy and understanding of how the technique applied. Free Sparring is where the student can use the techniques they have learned in one-on-one Sparring session. The students wear protective gears from head-to-toes, to spar each other, using the techniques and strategies they have learned in open combat, while gaining confidence along the way. Intermediate and advance students are required to Break boards for their testing. Depending on the belt level, the students will break a board using their hands or feet. In addition to practicing Taekwondo, the students are also taught the martial arts ideals of: Courtesy, Integrity, Perseverance, Self-Control, and Indomitable Spirit. By learning about the spirit martial artist, the students learn to control themselves and become better people. Once the students reach intermediate or advance level, they may start practicing Self-Defense and Weaponry. They will learn techniques and strategies beyond the basics for Self-Defense and avoiding unpleasant situations. The Weapons we practice are Bo Staff, Nunchaku (normally known as nunchucks), and Knife. Practicing weapons help students with coordination and build confidence. Although not required, attending a tournament is encouraged. We take students to attend different regional and even state level tournaments. Participating in a tournament allows the students to gain more experience by competing with different schools and styles. It gives the students an opportunity to judge their own techniques to other students of the same age across the bay area and even make a few friends along the way. It is an intensive, yet enjoyable experience.